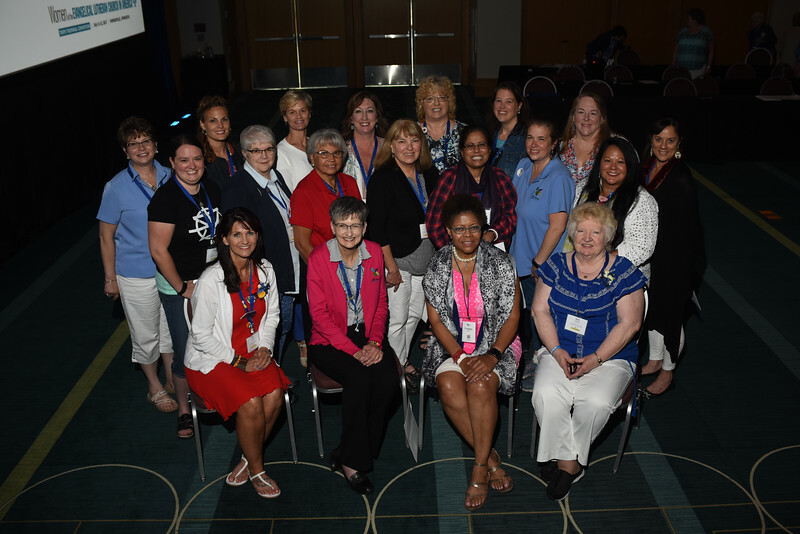 Tenth Triennial Convention | The newly elected 2017–2020 Women of the ELCA Executive Board. Row 1: Lisa Plorin, president (left); Becky Shurson, vice president; Freddie Jordan, secretary; Anna Sarver, treasurer. Row 2: Angela Bell (left), Elizabeth Burgess, Lydia Davila, Karen Voris, Rev Dinah Dutta, Anissa Canova, Tina Bigelow, Keala Simoes. Row 3: Lois Bylund (left), Sara Larson, Barbara Tormondsen, Kandy Pflaster, Sandra Grier, Joy Michalicek, Laura Kruegar. Not pictured: Viviane Thomas-Breitfeld, Lynette Todd.